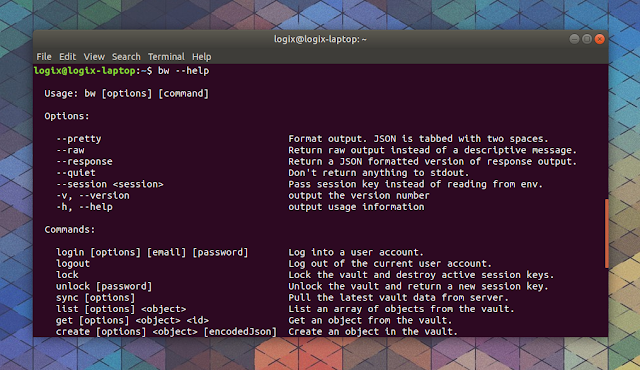 Bitwarden, the secure, open source password manager we talked about recently, added a command line tool to its list of apps you can use to access your passwords. Bitwarden CLI is currently in public beta testing, and according to its documentation, it includes all the features available in other Bitwarden client applications, like the desktop or browser extension. The Bitwarden command line interface is written with TypeScript and Node.js, and as a result it's cross-platform, supporting Linux, Windows and macOS. login [options] [email] [password]       Log into a user account. logout                                   Log out of the current user account. lock                                     Lock the vault and destroy active session keys. unlock [password]                        Unlock the vault and return a new session key. sync [options]                           Pull the latest vault data from server. list [options] <object>                  List an array of objects from the vault. get [options] <object> <id>              Get an object from the vault. create [options] <object> [encodedJson]  Create an object in the vault. edit <object> <id> [encodedJson]         Edit an object from the vault. delete [options] <object> <id>           Delete an object from the vault. export [options] [password]              Export vault data to a CSV file. generate [options]                       Generate a password. encode                                   Base 64 encode stdin. config <setting> <value>                 Configure CLI settings. For the Bitwarden CLI documentation you can visit this page. Since it's currently in beta testing, the Bitwarden developers are asking for feedback. Post any bugs, questions or other feedback in this issue from GitHub. To install the Bitwarden CLI binary in Linux (bw-linux.zip), extract it and place it in your /usr/local/bin/ folder (or somewhere else in your PATH).